My guest today, on the Steve Jobs inspired Join Up Dots free podcast interview is a man who I have wanted to have on the show for quite a while, as he is becoming more and more successful on his own terms. Back in the day he took a huge leap of faith as he was graduating from Babson College. Most people will accept the first offer that comes their way after their studies finish, but our guest did something quite different. He turned down a six figure offer from Wall Street and moved into his parent’s basement to start his company instead. And he did that with the creation of VideOblocks, a company that stores video clips for people to use to make their own video production more professional and well appealing to the viewers. In the first year VideoBlocks got their footage revenue up to a million dollars, which was the goal. hen then hired his first employee and realized this could be real. And in 2010 everything started moving quickly. Revenues grew from $1 million to $2 million to $4 million – within two years. But he was in deep with the day to day running of the company, and so decided on a very different path to the majority of CEO’s that we have had on Join Up Dots. He now travels around in an RV, experiencing America and the world, whilst allowing his brain to bring the growth building ideas to the fore. He has separated himself from the details, and now operates on a higher level by relaxing and enjoying his life which has allowed his business and its profits to increase exponentially. And that is where we will start todays episode of Join Up Dots. So how close was he to burn out, when he made the unusual decision to escape the hassles and set off on an adventure of discovery? And is the way that we should all operate, or does it just work for a business such as his? 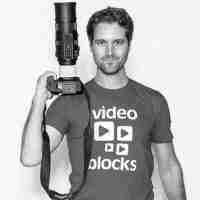 Well lets find out as we bring onto the show to start joining up dots, with the founder of Videoblocks Mr Joel Holland. Why it is that so many young entrepreneurs are lazy and dont see the real benefit of the hustle and grind through the early years. How you ust find the passion for the task before you do anything else, as it will make it so much easier to work towards success. Why he feels that his biggest mistake was not hiring people as soon as he could. It was a decision that slowed his progress down and could have ben easily resolved. Why so few people have what Joel calls the special mind, that ability to look at the world in way that nothing is impossible.